The Fool is completely innocent, like a new born baby. She is hungry to try new things to broaden her experiences. Her impulses are pure and she needs to act and create, even if other people do not understand why. 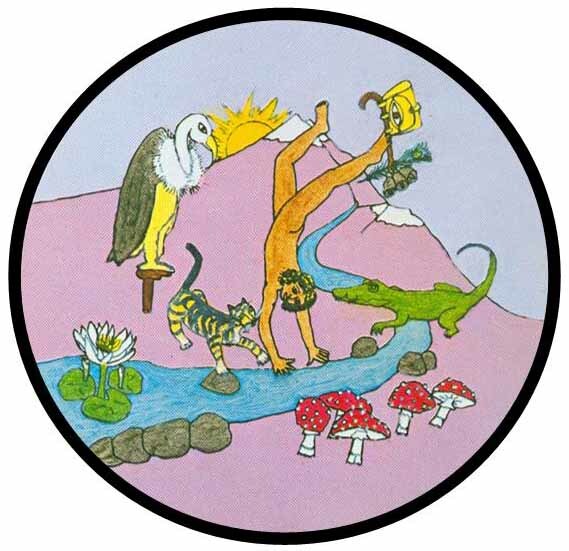 The Fool symbolizes our abilities to take risks, and will show up in readings where a person is contemplating doing something out of their usual comfort zone. A person behaves like “The Fool” whenever they take a chance. A Fool in an old fashioned Court was similar to the Jester, who could make jokes and clown around. Because of this, she had more freedom to speak freely than people of higher levels in the Court. This card is the essence of Life and Spirit, the spark of the Divine that we all have within us. In Motherpeace, The Fool is a sacred one who does not follow social conventions. She is crossing a river, walking on her hands, safe from the pygmy crocodile, blessed by the Goddess, hiding in the form of the Griffon. The Fool’s only possession is the Bag of Truth, attached to her ankle.